**Book received for review. All thoughts are my own. With the upcoming holidays from Thanksgiving through the New Year, it's the season of celebrations. Many of those celebrations revolve around food! Now, I must admit...holiday meals are some of my favorites. Not just the food itself, but also the company that comes with it. I look forward to these celebrations each and every year. But with so many food needs out there, it can be really hard to find delicious tasting dishes that everyone can enjoy. We need gluten free options, dairy free options, paleo options... and they have to be appealing enough so that everyone, regardless of their dietary preferences, can enjoy them as well. Where on earth are we supposed to find these recipes!? From the two-time New York Times best-selling author of Against All Grain and Meals Made Simple, comes 125 recipes for grain-free, dairy-free, gluten-free comfort food dishes for holidays and special occasions. When people adopt a new diet for health or personal reasons, they worry most about the parties, holidays, and events with strong food traditions, fearing their fond memories will be lost along with the newly eliminated food groups. 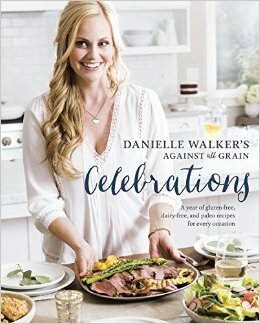 After suffering for years with a debilitating autoimmune disease and missing many of these special occasions herself, Danielle Walker has revived the joy that cooking for holidays can bring in Danielle Walker's Against All Grain Celebrations, a collection of recipes and menus for twelve special occasions throughout the year. Featuring a variety of birthday cakes, finger foods to serve at a baby or bridal shower, and re-creations of backyard barbecue standards like peach cobbler and corn bread, Danielle includes all of the classics. There’s a full Thanksgiving spread--complete with turkey and stuffing, creamy green bean casserole, and pies--and menus for Christmas dinner; a New Year's Eve cocktail party and Easter brunch are covered, along with suggestions for beverages and cocktails and the all-important desserts. Recipes can be mixed and matched among the various occasions, and many of the dishes are simple enough for everyday cooking. Stunning full-color photographs of every dish make browsing the pages as delightful as cooking the recipes, and beautiful party images provide approachable and creative entertaining ideas. Making recipes using unfamiliar ingredients can cause anxiety, and while trying a new menu on a regular weeknight leaves some room for error, the meal simply cannot fail when you have a table full of guests celebrating a special occasion. Danielle has transformed her most cherished family traditions into trustworthy recipes you can feel confident serving, whether you’re hosting a special guest with food allergies, or cooking for a crowd of regular grain-eaters. I love this cookbook! Not only does it cover those food heavy holidays like Thanksgiving and Christmas, but also celebrations for throughout the year. We find Thanksgiving favorites like turkey and cranberry sauce. We find holiday classics like hot cocoa and gingerbread houses. But, we also find spooky treats like mummy dogs or Easter favorites like ham. There are dishes for Father's Day, dishes for Mother's Day, dishes for summer and 4th of July barbecues. You can plan the perfect birthday party... with every turn of the page there are more grain free recipes that I for one am excited to try throughout the year! If you are gluten or dairy free or eating a paleo diet yourself, OR if you have someone attending your events that is- this book is a must see! With these amazing recipes, no one will miss the grains at all, they'll just enjoy the delicious meals at every celebration. Danielle Walker's Against All Grain Celebrations is available to purchase now. Love that its a great mix of recipes for every occasion!! I always worry about pleasing the masses at holidays or lunch dates and now I know how! Surprise! It's a Fall Giveaway!